Michael M. Crow, president of Arizona State University, explains why Florida Gov. 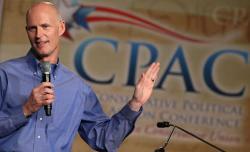 Rick Scott’s emphasis on practical education is short-sighted. The president of Arizona State University explains why Florida Gov. Rick Scott’s emphasis on practical education is short-sighted. As a university president, I can assure Gov. Scott that his approach to both higher education and economic development is misguided and counterproductive. The notion that we must strip away academic programs not seemingly relevant to workforce development reflects a simplistic and retrograde view of the role of higher education in the American economy. The governor is correct in one regard: The imperative to advance STEM education cannot be overstated. Given the importance of scientific discovery and technological innovation to our national competitiveness, we should focus on increasing the quantitative, scientific, and technological literacy of all of our students. But resolving the complex challenges that confront our nation and the world requires more than expertise in science and technology. We must also educate individuals capable of meaningful civic participation, creative expression, and communicating insights across borders. The potential for graduates in any field to achieve professional success and to contribute significantly to our economy depends on an education that entails more than calculus. Curricula expressly tailored in response to the demands of the workforce must be balanced with opportunities for students to develop their capacity for critical thinking, analytical reasoning, creativity, and leadership—all of which we learn from the full spectrum of disciplines associated with a liberal arts education. Taken together with the rigorous training provided in the STEM fields, the opportunities for exploration and learning that Gov. Scott is intent on marginalizing are those that have defined our national approach to higher education. The significance of a liberal arts curriculum for engineering students, for example, has been underscored by recommendations from within the National Academy of Engineering. James Duderstadt, president emeritus of the University of Michigan and an international figure in engineering education, has argued that professional demands in the various fields of engineering have become sufficiently complex to warrant greater emphasis on broadly based undergraduate preparation in anticipation of subsequent specialization at the graduate level, consistent with professional education in law and medicine. It is essential that we develop in our students the ability to understand the complexity and interrelatedness of our cultural, economic, natural, political, social, and technological systems. The point here is that we need all of the skill sets from anthropology to zoology as well as transdisciplinary perspectives to reinvigorate programs in civil engineering. Inspired engineering, in other words, could come as a consequence of familiarity with the development of counterpoint in Baroque music or cell biology. Or even the construction methods of indigenous tribes. Moreover, if we were to restrict opportunities for higher education only to the set of degrees associated with science, technology, engineering, and math, we would in fact oversupply the workforce with capacity in technological transformation and undersupply the knowledge-based economy with the broader set of skills necessary for high-speed, creativity-driven innovation. The objective of public universities should not be to produce predetermined numbers of particular types of majors but, rather, to focus on how to produce individuals who are capable of learning anything over the course of their lifetimes. Every college student should acquire thorough literacy in science and technology as well as the humanities and social sciences. Every student should have an understanding of complexity and sustainability and decision-making matched with a general awareness of entrepreneurship and business. From this breadth of experience, students gain the perspective and focus necessary to succeed in any academic field and subsequent career trajectory. Given the multiple dimensions and global interconnectedness of many professional sectors, the trend toward choosing two or even three majors is entirely appropriate. Needless to say, the challenge is to design universities that have the capacity to produce such individuals who are also ready to work within the contexts of initially narrower assignments. At the end of the day, the objective of our universities, both public and private, should be to create teaching, learning, and discovery environments capable of producing learners of the highest caliber. Differentiated learning platforms must accommodate the immense variability in types of intelligence and creativity that have made the United States the dominant source of innovation worldwide. Within this context, it is critically important that students develop the ability to move from subject to subject and problem to problem, and from environment to environment and opportunity to opportunity, in ways that unleash and utilize their innate capacities and creative potential. Such mental agility will allow them to establish new business enterprises, scientific or technological capabilities, social initiatives, and creative endeavors in every sector of the economy. It may come as a surprise to Gov. Scott, but the perpetual innovation that drives our economy could even be inspired by anthropologists.